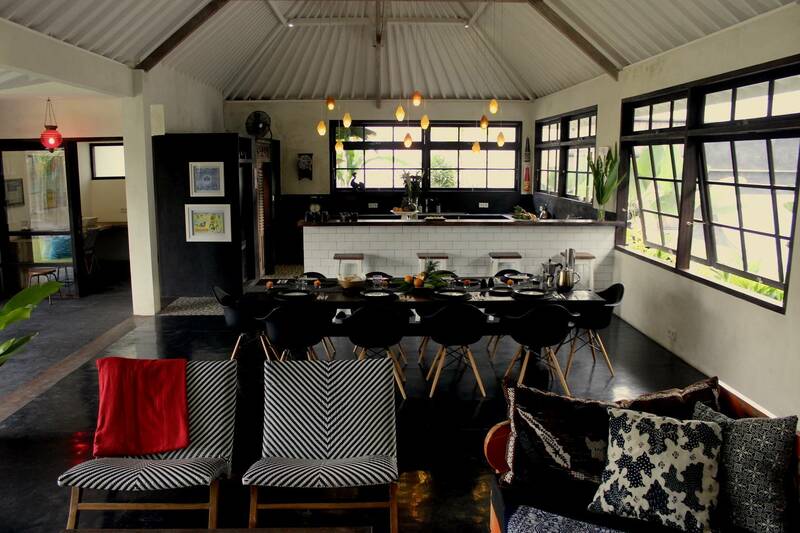 The villa offers guests a breezy laid-back lifestyle within an easy stroll of Echo Beach. 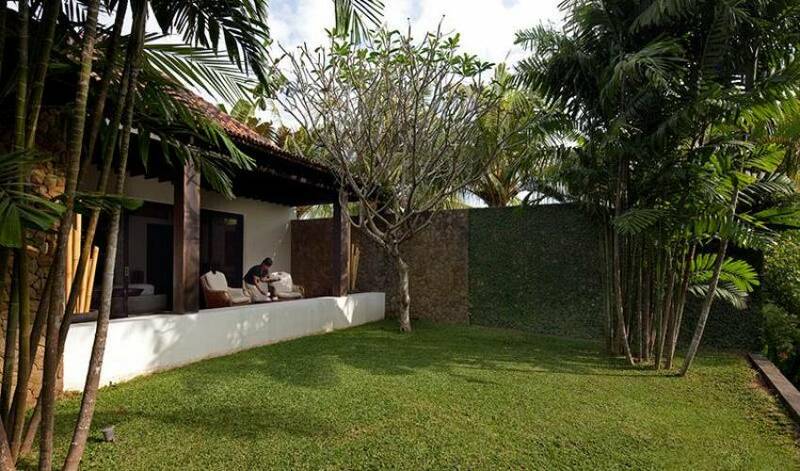 Fully staffed and with four private bedroom suites (including a double bunk room for kids), a large living pavilion, 15-metre pool, media room and barbecue terrace, it’s ideal for active families holidaying together, or for groups of friends drawn by Canggu’s noted surf breaks and sunset bar scene. 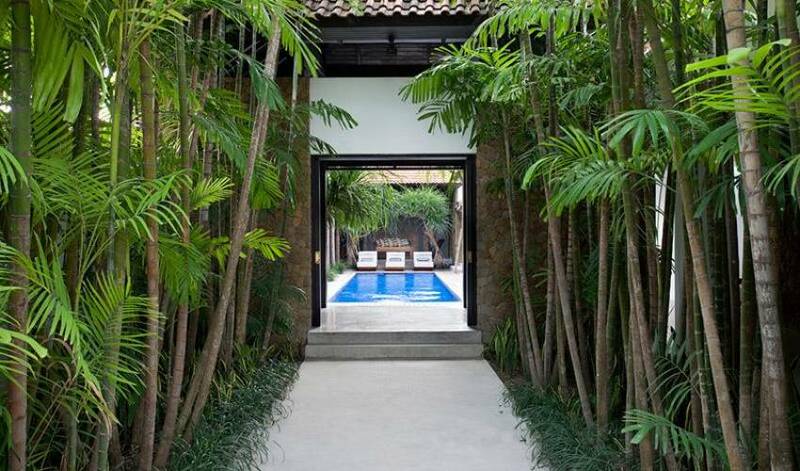 Moments from Echo Beach and securely set within high walls is this elegant four-bedroom villa, skillfully sculpted from interlinking pavilions, courtyards and covered walkways. 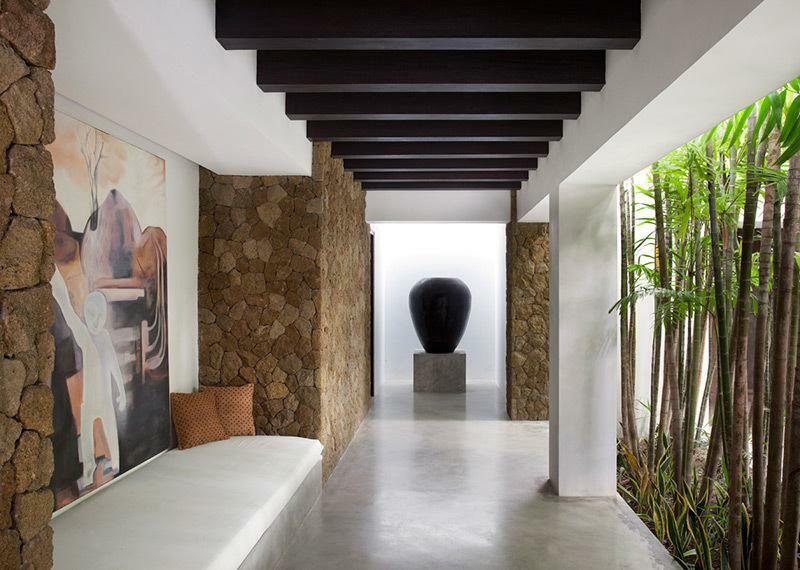 Created by notable Australian designer Stuart Membery, this villa features contemporary tropical interiors that blend seamlessly with their surroundings. 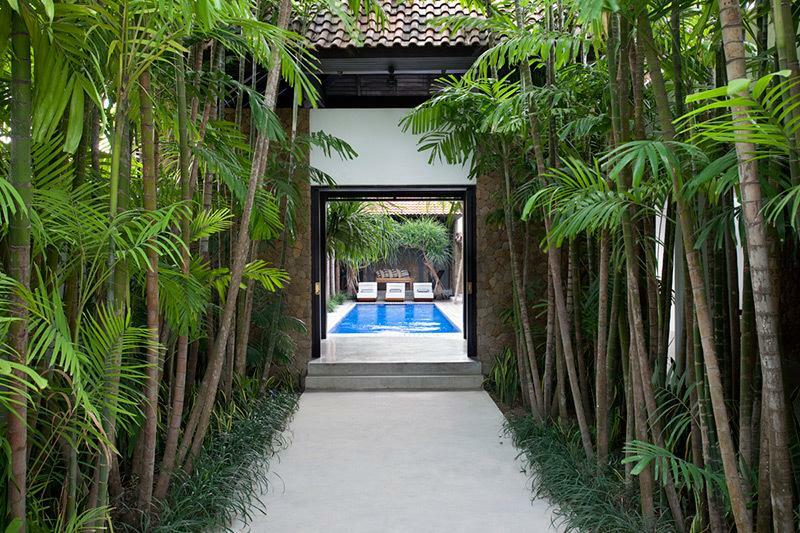 The split-level living pavilion is open-sided and faces the pool; the bedrooms feature private garden terraces or open onto the pool, and the courtyards provide plenty of private chill-out spots. 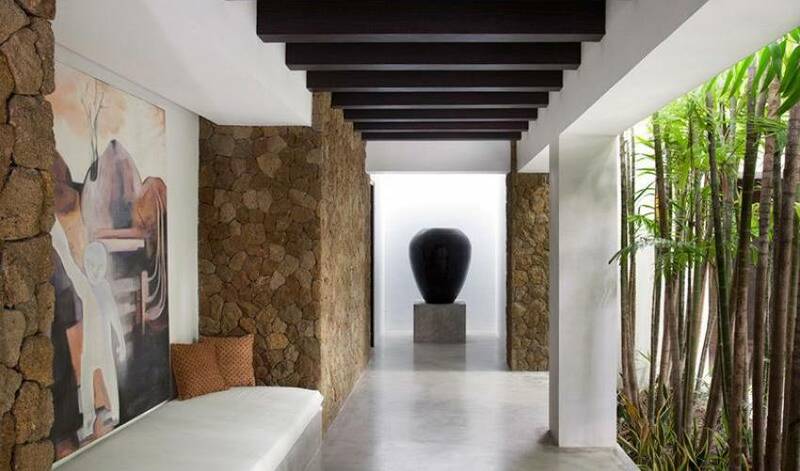 Over-sized sofas on polished concrete floors, black and white prints of Bali and abstract paintings on crisp white walls, rare artefacts in every corner – all attest to a modern design aesthetic where comfort is uncompromised. Parents have the choice of formal dining at the massive suarwood table, or informally gathering around a second table on the barbecue deck, and are sure to appreciate the chance to retreat to the terrace of their master suite for some peace and quiet. Not having to lift a finger may also make a welcome change; working discreetly behind the scenes, the villa’s staff includes an accomplished chef. The villa is only 300 metres – a ten-minute stroll – from Echo Beach with its pounding surf, expanse of sand, and popular cafés. 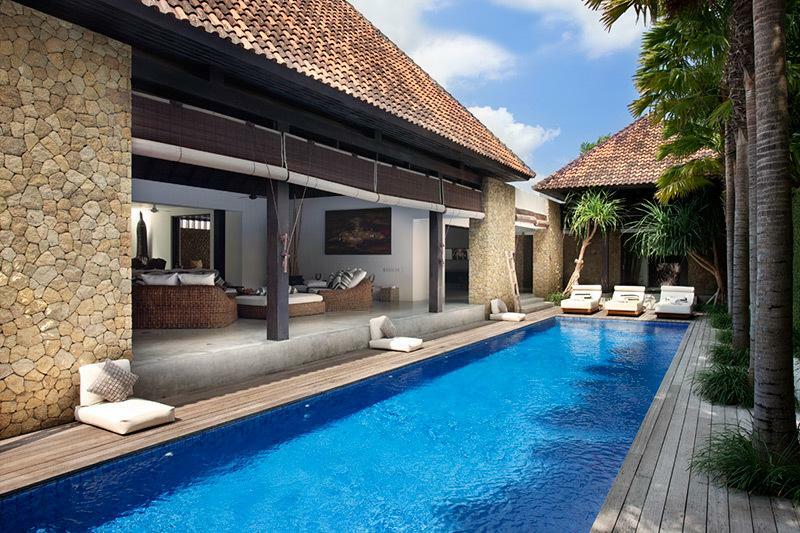 Accommodation at the villa is in two adjoining single-storey pavilions forming an L-shape around the swimming pool and linked by a covered courtyard. 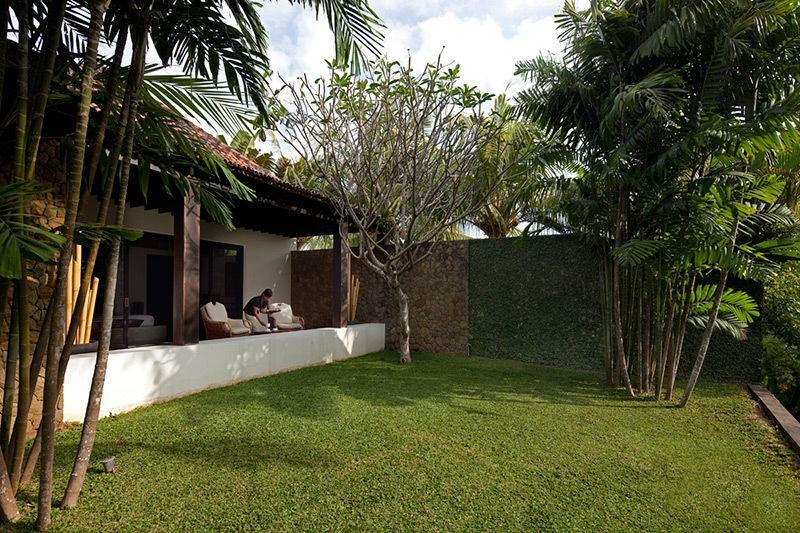 At one end of the villa grounds, looking across a small stream towards trees and rice fields, is the master bedroom suite and children’s bunk room. 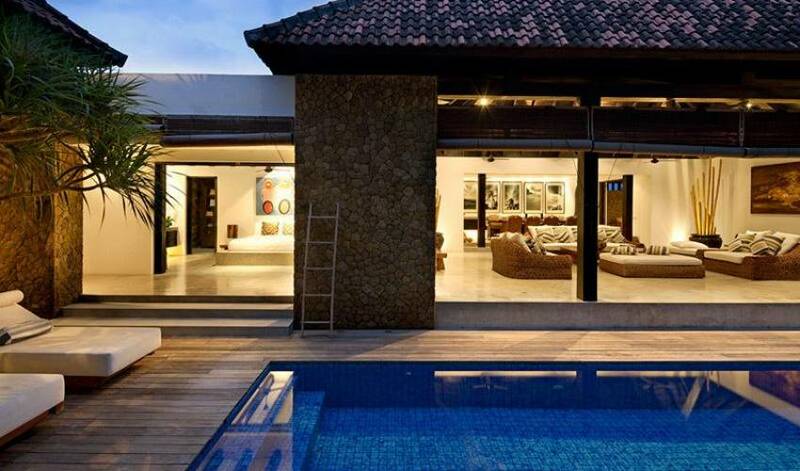 Facing the length of the pool and flanked by two guest bedrooms is the split-level living area with elevated dining area sandwiched between a covered courtyard terrace and the kitchen with covered barbecue area beyond. Towards the entrance is a multimedia room and guest cloakroom. At the heart of the villa is a huge fan-cooled and spilt level living area spreading out under a vaulted pavilion roof and opening onto the pool terrace. Curvaceous wicker sofas with over-sized cushions cluster around a coffee table while statuesque artefacts line benches set below enormous paintings. A few steps lead up to the dining area where a solid suarwood table with stately armchairs seats up to 10 guests in style. To one side an ironwood deck provides an alfresco sitting area looking onto a courtyard garden, while to the other, tucked behind sliding doors, is the beautifully designed and well-equipped kitchen, beyond which is a pergola-roofed barbecue dining deck. The air-conditioned media room provides a cool, comfortable entertainment hub for guests, who can languish on sofas and ottomans and watch a movie on the 52-inch TV. There’s a selection of DVDs, books and board games to choose from, as well as a Playstation 2. Nextdoor is a guest washroom complete with open-to-sky rain shower. A sun deck wraps around two sides of the 15-metre pool, furnished with loungers and outdoor cushions. 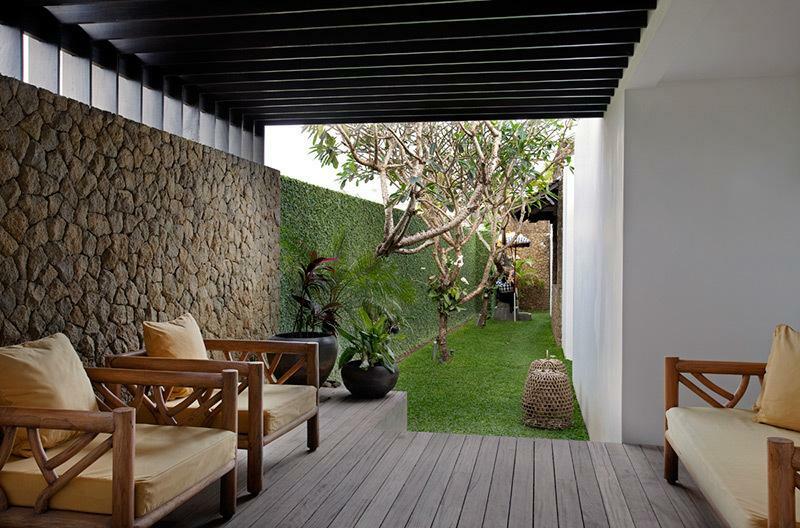 The veranda in front of the master bedroom, furnished with a traditional Indonesian daybed, provides another casual seating area, while the terraces behind the master suite and bunk bedroom serve as private corners for quiet retreat. All four bedrooms are handsomely designed with polished concrete floors and a strong black-and-white palette reflected in framed halftone photos, animated by colourful paintings. Facilities include 32-inch TVs, DVD players and iPod docks, and there’s air-conditioning throughout – even in the bathrooms. 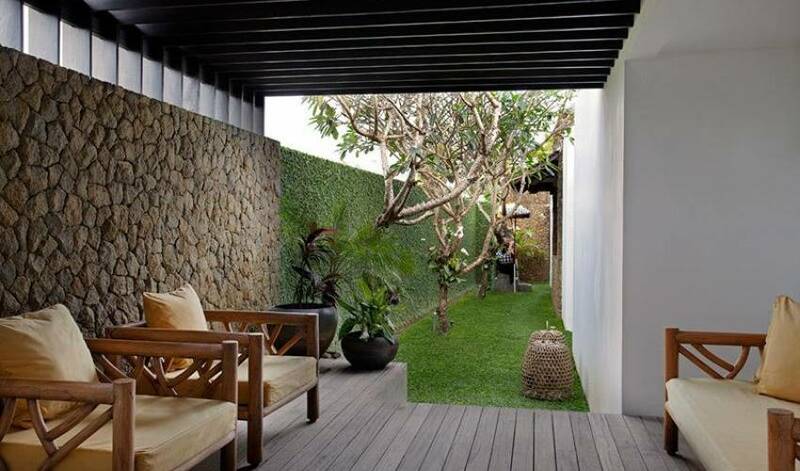 The master suite comprises a huge bedroom, bathroom and dressing room, and a covered terrace with seating looking onto a small garden edged by a stream. Striking artefacts are artfully placed and the king-size bed is positioned to enjoy glimpses of rice fields beyond a screen of trees. Within the bathroom is a statement bathtub set before glazed doors opening onto the terrace. Both guest bedrooms are furnished with king-size beds on bases of polished concrete facing the pool. Each has an ensuite bathroom with semi-open-air shower. 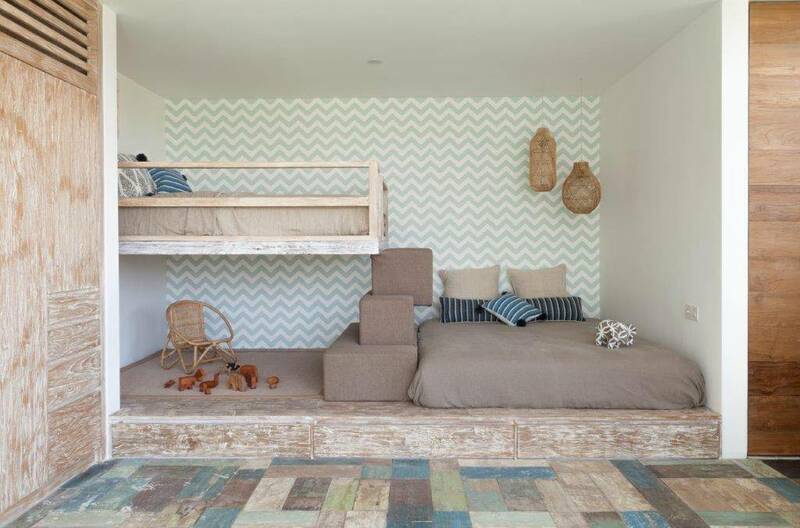 Lining an entire wall of this delightful bedroom is a handsomely designed set of four bunk beds. 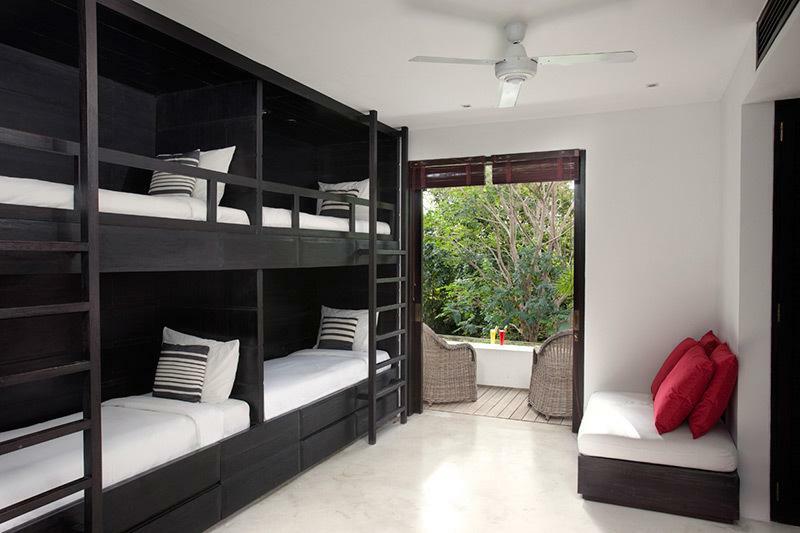 Kids can curl up on floor cushions and enjoy a movie on the 32-inch TV, or spend some quiet time on a private terrace. 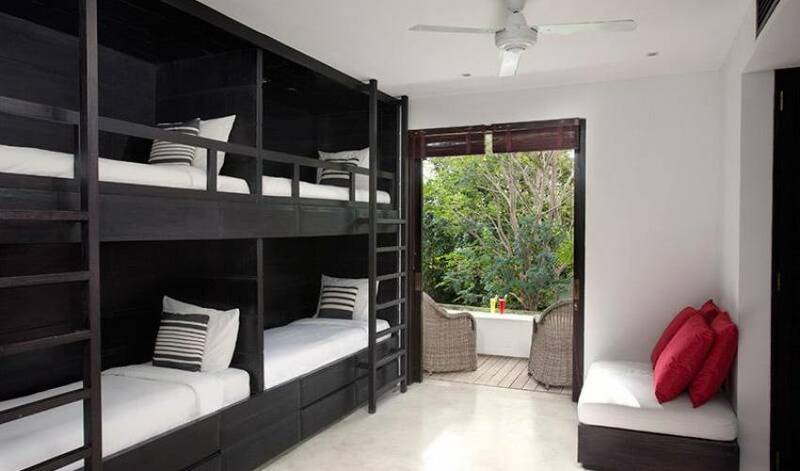 The room, which has an ensuite bathroom, can be converted to a family room with the addition of a queen-size bed. 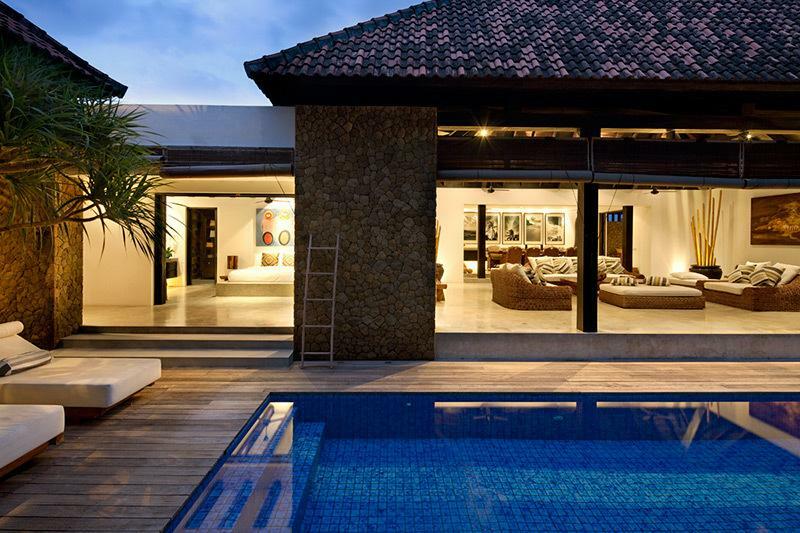 Located in Canggu on Bali’s south-western coast, Villa Hana is a short walk from Echo Beach – noted for its powerful surf breaks and panoramic coastline views. Farmers tend their crops and cows graze in the adjoining fields, which are dotted with a few other luxury villas leading to the ocean. A growing number of beachfront restaurants, bars and boutiques fuels a lively social scene within this rural idyll and surfers’ haven. 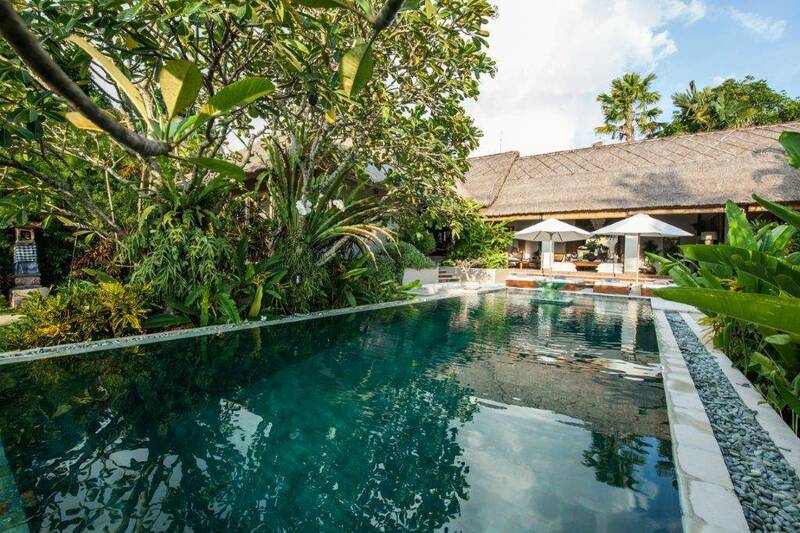 The antique-filled Hotel Tugu and yoga-scene Desa Seni are a few kilometres away, and those seeking brighter lights and late nights can be in Seminyak in well under 30 minutes.